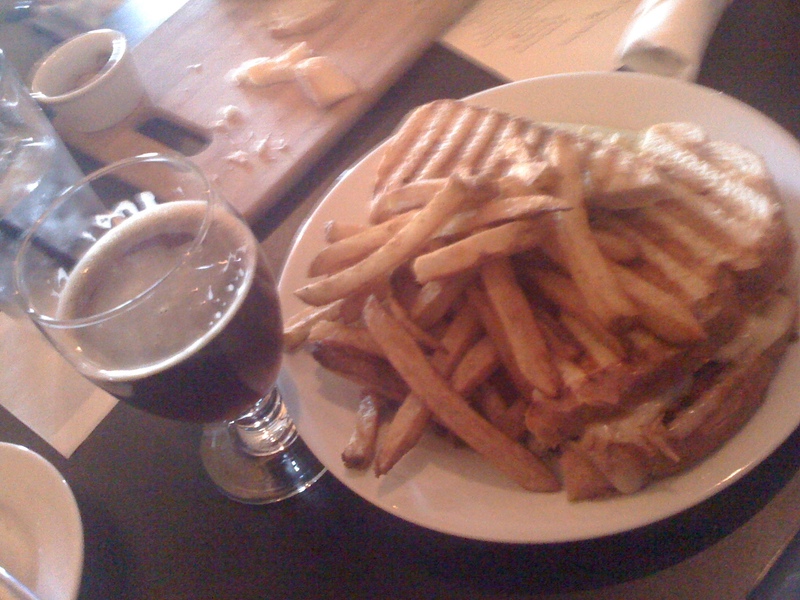 Philly Food and Beer: Station Taproom (Downingtown) - Great Menu. Great Beer. Station Taproom (Downingtown) - Great Menu. Great Beer. Station Taproom is located across the street from the Downingtown train station. It's a quaint little corner spot that is hiding a fine share of small, simple, yet well done grub and drink. Pictured to the above is(was) the cheese plate which was a great segway into the Cuban Panini with Truffle Fries. All outstanding items which I would repeat in an instant. Kid friendly with an excellent Mac n' Cheese that will win over any adult. How is the beer scene in this establishment? 11 taps, all winners including a beer engine pumping out a hoppy treat when available. Shown here is a Belgian Dubbel by White Birch Brewing. This is the kind of place where you will be treated friendly by every member working in the place. For the one time visit, the friendliness and customer service wowed me. If that didn't do the trick, the food and beer selection certainly did. S.T. reminds me of a tiny version of a cross between 2 Main Line establishments featuring craft beer and finely tuned menus, TJ's, and Teresa's Next Door. Sure, Victory Brewing rules Downingtown but now there is another fine spot to grab some craft beers and some nice food. I can't wait to enjoy this pub again with family and friends. With Drafting Room alums, Sean McGettigan, and Mark Barthmaier at the helm, the continuous flow of craft beer and fine food are in good hands.